There can’t be many things worse than getting stranded in the desert in the middle of a sandstorm, with limited water and the constant risk of death by dehydration hanging over you. Perhaps an evening watching Adam Sandler movies or contracting a particularly aggressive strain of Ebola could top it, but only just. 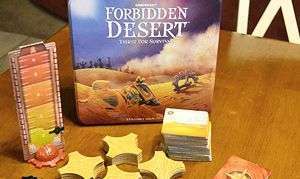 Luckily Forbidden Desert, is just a board game set in a desert during a sandstorm, and unless you run out of Diet Coke, you’re unlikely to be dying of thirst whilst playing it. I wish I could say the same for the risk of Adam Sandler arriving to give you Ebola, but you can never quite tell with that man. Designed by Matt Leacock, the man probably most famous for creating Pandemic, and published by Gamewright, Forbidden Desert is the follow up to the hit Forbidden Island, and aims to refine and improve upon the formula that was so successful for Island back in 2010. Players once again take on the roles of adventurers, only this time they are looking for an ancient flying machine which was created by an ancient civilisation now lost to the sands of time, and also the sands of this bloody desert. The object of the game is to search the desert and find four pieces of the machine and then make your escape before either thirst kills one of your party, the storm reaches lethal proportions, or you get buried in sand. Before the game can begin, the board, which is modular in nature, needs to be set up. This is made up of twenty-four double sided Desert tiles laid randomly in a 5 x 5 grid, the centre of which is left empty and represents the Sand Storm, which will move around as the game progresses. On one side of the desert tiles is simple open desert, whilst the other side of the tile will show part of the ancient city hidden beneath the sand. The art on the desert side of the Desert tiles are the same, with the exception of the helicopter crash site where players start, and also three water oasis tiles, two of which will contain lifesaving water whilst the other will just be a mirage. Players will excavate these tiles as the game goes on and reveal the city piece by piece. In addition to the above, nine of the Desert tiles will also begin with a Sand tile laid on top of them. These Sand tiles will always start in the same place and will form a diamond shape on your 5 x 5 grid. Players will then randomly select one of the six roles available in the game. Each role has a different special ability and also starts with a set amount of water in their canteen. Each of the roles are useful in their own way, although some are certainly better than others. The player with the smallest amount of starting water always goes first and can take one of the following four actions; Move, Clear Sand, Excavate Tile, and Collect Machine Part. All of the possible moves are pretty self-explanatory, however in order to excavate a desert tile and flip it, the tile needs to be clear of sand tiles, and before you can collect a piece of the machine you first need to locate it; more on that later. Players don’t need to use all four of their actions and can end their turn whenever they choose, at which point the sandstorm moves. The direction in which the sandstorm moves is determined by the storm deck. Cards equal to the storm intensity level are drawn from the deck and allow the storm to move up to three spaces in any direction. This is represented on the board by tiles sliding around to fill the gap in the grid, much like those sliding picture tile puzzles you used to do as a kid. Any tiles moved by the storm have sand tiles added to them and if any end up with more than one sand tile it becomes impassable (unless you have the Climber role) leaving players forced to clear the sand or go around. With there being no limit to how many sand tiles can stack onto a desert tile this can become really problematic if not kept in check, especially as you will lose if you come to place a sand tile and there are none left to place. If the storm wasn’t bad enough already, hidden within the storm deck are two other types of card, “Storm Picks Up” and “Sun Beats Down”, the former increases the number of storm cards that are drawn at the end of a player’s turn, this obviously increased the chances of the storm moving and making life even more difficult for you. Additionally if the storm intensity level reaches a certain level as indicated on the Storm Chart you lose the game. The Sun Beats Down card forces all players to take a sip of water from their canteen. It’s probably obvious to say, but if any player runs out of water and you can’t take a sip you lose the game. To help offset the nasty storm deck, there is an Equipment Deck which is full of useful items to help players out. Common equipment cards like the Dune Blasters will clear all sand from an adjacent tile, whilst the Jet Pack will allow you to instantly move to any unblocked tile on the board. Rarer items such as the Time Throttle lets you take an extra two actions on that turn, and the Secret Water Supply will give you and any other player on your tile two portions of water each. All of the equipment cards can be used at any time and don’t cost an action, however they can only be used once and then have to be discarded. Games have been saved from the brink with effective use of Equipment Cards and they go some way in offsetting the dreaded Storm Deck. As play proceeds, players will start revealing the city hidden beneath the sand. In order to reveal the locations of the machine parts, Forbidden Desert employs a clever little mechanic. Each of the four machine parts has two corresponding Desert tiles which, when both found, will point to a location where the machine part is located. One of the tiles will indicate a row and the other will indicate a column. Once both are revealed you can place the machine part on the tile that intersects the highlighted column and row. Players will then need to move to this tile in order to collect the part. I was quite impressed by this feature, and it works very well. It’s certainly an improvement on the mechanic that Forbidden Island used which just required you to find the matching tiles. Once all four pieces of the flying machine have been found and collected, all players must make it to the launch pad (which must also be excavated and sand-free) and then escape the desert to win. 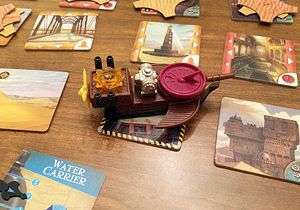 Forbidden Desert uses a number of very simple concepts and combines them all to create a very enjoyable and highly replayable game. The random layout of the tiles, and the different combinations of playable roles, all combined with the unpredictability of the storm mean that no two games are ever quite the same. However, despite this being a fun game, whether you win or lose largely comes down to luck and the order in which the Storm Deck deals out cards. In my games we were often killed off early by multiple Sun Beats Down cards being drawn in quick succession. Unfortunately there isn’t much you can do about this, such is the nature of the game. However if things are getting a bit too much for you there is an option to adjust the difficulty level, this is done by adjusting the starting storm intensity level. So if you are finding the normal difficulty level too easy, there’s Elite and even Legendary to try, conversely you can start on Novice if you’re new to the game and Normal is a bit too much to begin with. So far I’ve only beat Elite twice in about twenty or so tries, and the one and only time I tried Legendary didn’t end well. 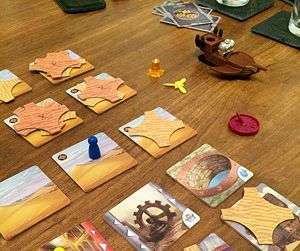 Matt Leacock impresses again with Forbidden Desert. He’s created a well thought-out co-op game which builds nicely on the foundations of its predecessor Forbidden Island and fixes many of the shortcomings. It’s quick to learn but difficult to master and, despite the sometimes unfair nature of the game, I’ve had a lot of fun with it. The components are great and I’ve never once thought I had been short changed in terms of quality. For the £20 or so you’ll pay for this game, it provides excellent value for money as it should see plenty of table time. If you like your co-op games then this is definitely one of the best. Matt Leacock may not have surpassed the giant that is Pandemic, however it’s a respectable effort which deserves your attention.